Hoping to save lives through forewarning of quakes in a geologically active zone, scientists linked to U.S. space agency NASA and a Turkish research group on Friday launched a new earthquake prediction facility in Istanbul. The facility is the "first of its kind in the world, a station so extensive and detailed that it can warn of an earthquake two to three months in advance," Özcan Işıklar, the mayor of Istanbul's Silivri district, told Anadolu Agency at the opening. The facility was established through a collaboration between Turkey's Natural Movements Research Foundation (DOHAD) and the GeoCosmo Research Center Foundation, a California-based group associated with NASA. "We will measure plenty of data and assess it. The assessment may take a while. Our purpose is to notify [beforehand] of the place, time, and intensity of a quake," said Ronald Karel, a dual Turkish-French citizen and vice president of GeoCosmo. Fuat Agalday, DOHAD's chairman, stressed that depending on a number of factors, large, destructive earthquakes can be predicted a month in advance. The devastating 1999 Marmara earthquake -- with an epicenter near Izmit, only about 100 kilometers (62 miles) from Istanbul -- took 17,000 lives and left thousands homeless. 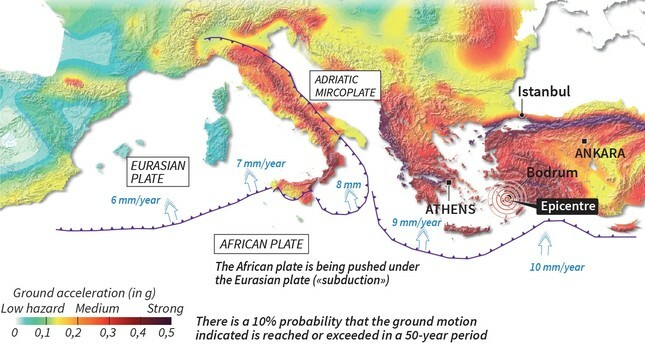 The motion of the North Anatolian Fault is likely to produce future quakes in the same region.